We live in a big house. My last house, which I designed, was 960 square feet and was on multiple levels; Kelly was pregnant with Hugh and a crawling baby would have been maimed in no time flat, there were so many places to fall. I have found every place I have ever owned by poring over Toronto property data maps and finding aberations; the last house was on a lot with surprisingly high zoning permissions, and this house was on a winding short street, very unusual in Toronto that is mostly on a straight grid. It was cheap; it was a transitional part of town, there were some structural issues and the interior was held together by the wallpaper. But it was 2600 square feet on three floors with six, count’em, six bedrooms. One became my office; another a library; another a climbing gym and then home theatre; another just for junk. On the back was a sort of enclosed sunroom that was a kitchen and we use as a laundry room. 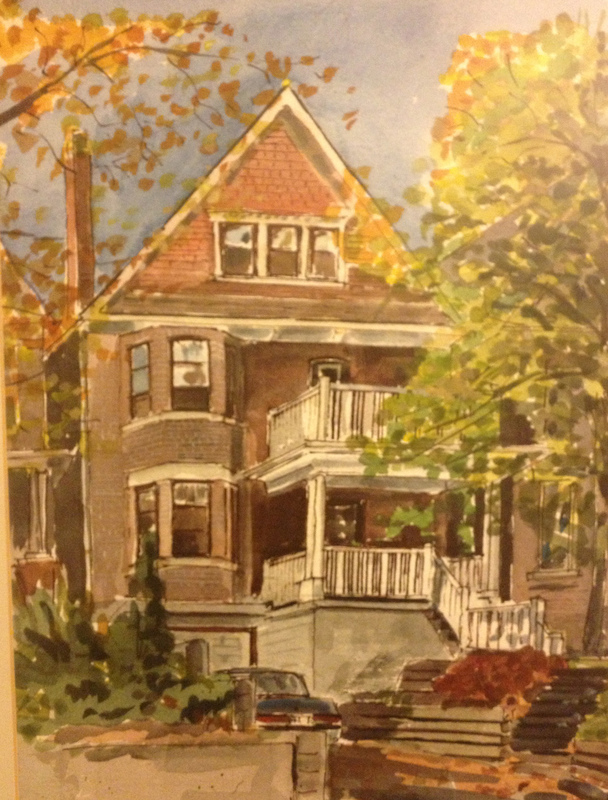 As you can see in the wonderful watercolour by Fred Kasper, it is three stories plus a basement that has a garage drilled into it by a previous owner. Now the kids are grown and moved out, and Kelly and I are rattling around in it. The laundry room is falling off the back and the porch is falling off the front. It will be expensive to fix, and I have wanted to sell for years. Kelly doesn’t want to move. What to do? It hit me last month: duplex it. My daughter and three friends were looking for an apartment in the area and couldn’t find one, why not split the house and rent to them? So that is what we are doing. John Laumer is documenting his major renovation of a suburban house; I am going to document the subdivision of my house and the downsizing that we are going to do, the stuff we are going to have to part with, the hard design decisions we are going to make. Although I am an architect and could do this myself, I was never happy with anything I designed (except that last house) and am have hired a young architect to do the project, so I am going to see all sides of this issue and discuss them here. I hope that this will be fun, and not a horror story. October 24, 2012 in Live.